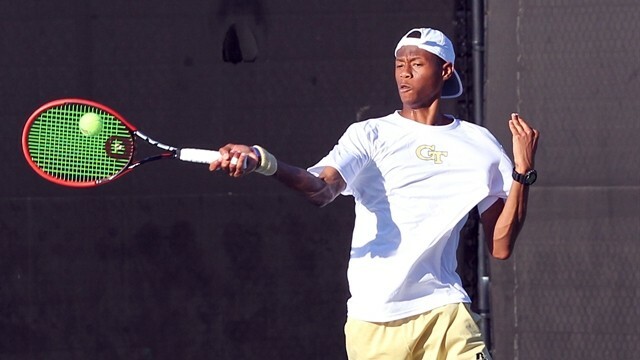 This year’s collegiate main draw wild card will go to Georgia Tech freshman Christopher Eubanks. Eubanks was named to the All-Atlantic Coast Conference team this season after finishing with a 14-11 record in dual matches as the No. 1 or 2 player in the line up, and a 24-19 singles record for the year. The Yellow Jackets star posted wins against four of the nation's top 40 ITA ranked players including defeating last year’s wild card player, Nathan Pasha of Georgia, twice before wrapping up his season in the second round of the NCAA Singles Championship. Eubanks will play his first match on College Night, Tuesday, July 28. This will be the Atlanta native’s first main draw appearance in an ATP World Tour event after falling in the qualifying rounds of the 2012 BB&T Atlanta Open to Lukas Dlouhy, 6-7(3), 0-6, and Jeff Dadamo, 2-6, 3-6, in 2013. Top competitive male tennis players from across the area had the opportunity to play for a wild card into the BB&T Atlanta Open qualifying tournament and compete against some of the world’s top players after four Metro Atlanta tennis centers held tournaments leading up to the main event. The winner of the BB&T Atlanta Open Wild Card Challenge will be determined after a four-player playoff between Georgia Tech sophomore Michael Kay, Xavier University of Louisiana senior Kyle Montrel, University of Kentucky sophomore Trey Yates and Trent Bryde of Lifetime Athletic Tennis Academy. In the Hudlow Tennis Center final held Thursday, June 11 at Lifetime Athletics at Peachtree Corners (formerly Racquet Club of the South), Kay defeated McClain Kessler, a rising freshman at the University of Florida, 3-6; 6-0 7-6. In the other three finals played on Wednesday, June 10, Montrel defeated Connor Thompson, a sophomore at UNC Greensboro, 6-4, 6-4 at Bitsy Grant Tennis Center; Yates overcame Galen Lee of Tennis Academy of the South 6-4, 6-3 at Sandy Springs Tennis Center; and Bryde beat fellow academy mate, Alex Phillips, 6-4; 6-3 at Lifetime. The BB&T Wildcard Championship will be held on July 21 and 22 on Court 3 at the BB&T Atlanta Open Tournament site. The winner of this Championship will gain entry in to the BB&T Atlanta Open Qualifying draw, which begins on July 25.